This luxurious ewer, whose shape is copied from earlier metal liturgical vessels, would have held wine or other liquids on a Renaissance dining table. Glassworkers assembled this example from four separate parts: a rounded body with narrow neck, a curved tapered spout, a solid handle, and a hollow foot. 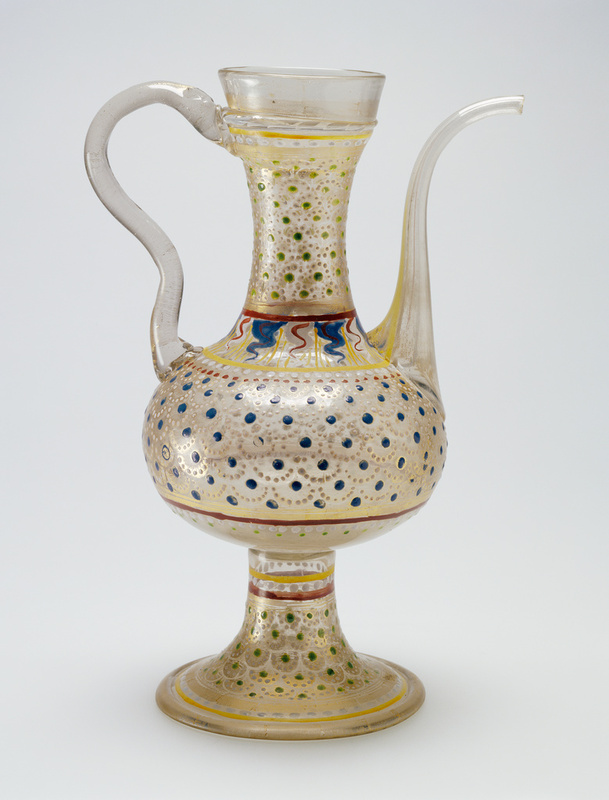 An enamelist colored the ewer's body before the spout and handle were attached. Venetian glass of the period typically features "fish-scale" gilding punctuated by blue dots. The wave-like pattern around the neck may represent the sun's rays--the insignia of the followers of Saint Bernard of Siena--or it might have been used here only for decorative effect. Exhibition of Italian Art 1200-1900, exh. cat. (London: Royal Academy of Arts, 1930), pp. 437-38, no. 955L. Three Great Centuries of Venetian Glass, exh. cat. (Corning, New York: The Corning Museum, 1958), pp. 44-45, no. 23. Barovier Mentasti, R., et al. Mille anni di arte del vetro a Venezia, exh. cat. (Venice: Palazzo Ducale and Museo Correr, 1982), p. 79, no. 69. "Acquisitions/1984." The J. Paul Getty Museum Journal 13 (1985), pp. 244, no. 179. "Recent Important Acquisitions Made by Public and Private Collections in the United States and Abroad." Journal of Glass Studies 28 (1986), p. 101, no. 10. The J. Paul Getty Museum Handbook of the Collections. 3rd ed. (Malibu: J. Paul Getty Museum, 1991), p. 202. Bremer-David, Charissa, et al. Decorative Arts: An Illustrated Summary Catalogue of the Collections of the J. Paul Getty Museum (Malibu: J. Paul Getty Museum, 1993), p. 217, no. 377. The J. Paul Getty Museum Handbook of the Collections. 4th ed. (Los Angeles: J. Paul Getty Museum, 1997), p. 237, ill. Masterpieces of the J. Paul Getty Museum: Decorative Arts (Los Angeles: J. Paul Getty Museum, 1997), p. 10, no. 3. Hess, Catherine, and Timothy Husband. European Glass in the J. Paul Getty Museum (Los Angeles: J. Paul Getty Museum, 1997), pp. 81-83, no. 18. The J. Paul Getty Museum Handbook of the Collections. 6th ed. (Los Angeles: J. Paul Getty Museum, 2001), p. 237, ill.
Wilson, Gillian, and Catherine Hess. Summary Catalogue of European Decorative Arts in the J. Paul Getty Museum (Los Angeles: J. Paul Getty Museum, 2001), p. 234, no. 480. Baumgartner, Erwin. Venise et façon de Venise: verres renaissance du Musée des arts décoratifs (Paris: Union centrale des arts décoratifs, 2003), p. 32. The J. Paul Getty Museum Handbook of the Collections. 7th ed. (Los Angeles: J. Paul Getty Museum, 2007), p. 186, ill.